There is no end in sight to the luxurious amenities and accommodations that Secrets Maroma Beach has to offer. Situated on a stretch of beach regularly voted one of the best in the world, Secrets Maroma Beach is an all-inclusive, adults-only resort that offers 24-hour concierge service and the latest technology advances to make sure all of your needs are met. Unlimited luxury and connectivity means you can choose to check-in or check-out during your stay. Use the free WiFi and international calling to post pictures of the beach or check in with friends and family. Or put the phone aside and learn to salsa dance, enjoy a premium cocktail at the swim-up bar or take a soak in your in-room Jacuzzi. Secrets Maroma is located 30 minutes south of the Cancun International Airport. Select an over-sized standard or swim out suite and enjoy 24-hour room service, 24-hour concierge service, WiFi, a mini-bar, furnished terrace or balcony, in-room jacuzzi, sofa, laptop size safe, iron, hair dryer, satellite television with DVD player, coffee and tea maker and an iPod docking station. Upgrade to a Preferred Club room and you’ll also receive access to a private lounge, a pillow menu and an upgraded mini-bar and bath amenities. An international buffet, cafe, 7 a la carte restaurants and 24-hour room service equal round-the-clock gourmet dining. Fresh seafood, sushi, French and Italian cuisine are all available. Premium wines, beers and cocktails can be enjoyed on the beach, at the swim up bar or any of the 5 other bars and lounges located around the resort. Or, if you’re looking for a night out, arrangements can be made for dinner and drinks at 10 other participating resorts along the Riviera Maya. The resort asks that guests comply with the dress code specified in each restaurant. Delight in sensory overload at the Secrets Maroma Beach Spa where you’ll be pampered inside and out. Select a spa body treatment like the chocolate body wrap or after sun relief, relax with a hot stone massage or pedicure or enjoy an oxygenating facial. In addition, multiple spa packages and customization options are available. Whether you want a sunset ceremony on the beach or a sunrise ceremony in the wedding gazebo, Secrets Maroma Beach has the perfect wedding package available. A wedding coordinator is available to help choose the right reception location, photographer, food and assist with the legalities. Contact us for more information on wedding packages and rates. 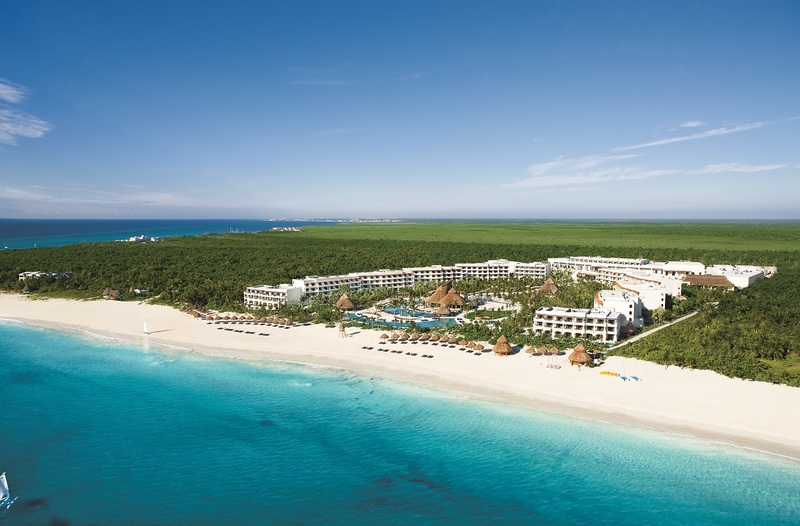 Complimentary green fees for the nearby Grand Coral Golf Course are offered to guests of Secrets Maroma Beach. Amateurs and pros alike will enjoy playing on the Nick Price designed 18-hole course. Up to 600 guests can be accommodated in the state-of-the-art meeting facilities. More than 7,400 square feet of space can be divided up into a variety of layouts and options. With stunning views and lavish rooms with WiFi the resort is ideal for all functions and events. Contact us for a personalized quote with group rates.